BMW discovered at Saddlers Grove, Mulhuddart. A MAN HAS been seriously injured in a shooting in west Dublin this afternoon. The incident occurred shortly after 5pm at Briarswood in Mulhuddart. A man in his 20s was shot multiple times. He was taken to Connolly Hospital in Blanchardstown where he is being treated for gunshot wounds, gardaí have said. Dublin Fire Brigade and gardaí attended the scene of the incident. Both areas have been sealed off pending the arrival of crime scene examiners. A silver BMW 3 Series car was later discovered on fire at Saddlers Grove, Mulhuddart. 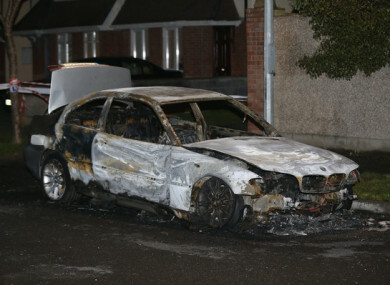 Gardaí believe that this car was involved in the shooting. Both areas have now been sealed off and a technical examination is being carried out by Garda Crime Scene Examiners. Gardaí are appealing for anyone who was in the Blakestown Road or the Saddlers Grove area between 4.30pm and 5.30pm to contact them. Gardaí are also appealing for anyone who was driving in the area and may have dash-cam footage to contact Blanchardstown Garda Station on 01 666 7000. Local Sinn Féin councillor Paul Donnelly has said he is “saddened and shocked” by today’s shooting and called for more gardaí resources to tackle crime. “Our community is very worried about community safety and we need assurances that extra resources are assigned to Dublin 15,” he said. Email “Man seriously injured after being shot multiple times in west Dublin”. Feedback on “Man seriously injured after being shot multiple times in west Dublin”.